Many of you know I love “Sketchnote Preaching.” If you’re not sure what that is here is where I was interviewed on Sermon Smith and another one on Sketchnote Army. Below is a post about how I got into doing this, what it is and how you can to started yourself. During the third of my four weeks off I hit a major wall. I had written three chapters and was at the point that I needed to bring together a variety of key ideas and thinkers and I just couldn’t figure out how they all wove together – not exactly where you want to be this late in the game but that is where I was with it. My advisor, Ryan Bolger (Fuller Seminary), told me I needed to take a day to pray and meditate. This was a time where I needed an “aha” moment and I couldn’t force that to happen. This was not the advice I wanted! I had a week and a half left of the mini-sabbatical the church gave me and I needed to keep working, but he was right, no matter how hard I tried I couldn’t make it happen. So I prayed and spent the day wandering around trying not to panic, writing in my journal key ideas, summarizing claims, and asking God for mercy. Late that afternoon, I found myself blankly staring out of the window at my favorite local coffee shop when it occurred to me that I should stop writing out my key arguments and instead I should draw them out. Growing up I was an avid drawer and I was pretty good too, but ever since I entered seminary my main creative outlet moved more towards writing. Then I opened my notebook and I began to draw the images that were floating in my head. I drew people. I drew lines and arrows. 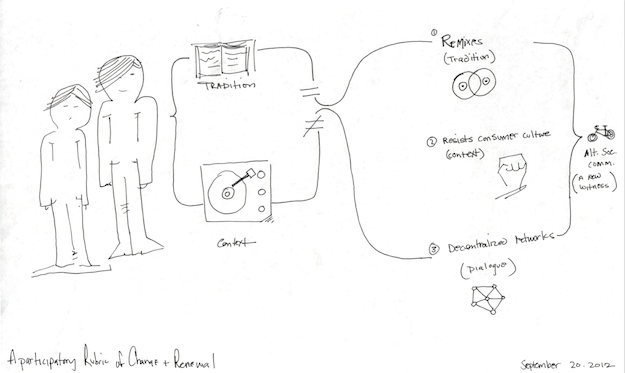 I drew symbols to represent texts, record players, networks, remix, critical mass and all the parts of my dissertation. When it was done I had before me my very first – of many to come – illustration of the “convergent model” – which is basically a renewal model for faith communities that want to draw on their tradition within new cultures while being “participatory.” In a matter of about 10 minutes, I went from not being able to explain succinctly or clearly what my model was or how it worked, to not only being able to explain it but show it with some very basic illustrations. Here’s that original image. It’s rather simple and has become more complex overtime, but this was all I needed to get through my block. …Visual notes that are drawn in real time. Through the use of images, text, and diagrams, these notes take advantage of the “visual thinker” mind’s penchant for make sense of—and understanding—information with pictures. In short, it is purposeful doodling while listening to something interesting. Sketchnotes don’t require high drawing skills, but do require a skill to synthesize and summarize. Begin reading the passage over and over in the form of lectio divina. Highlight key words and images that strike me. Listen for the Spirit behind the text. Study and take notes on blank sheets of paper. Any key images or main ideas get drawn up as “sketchnotes.” Spend more time listening to what is emerging. 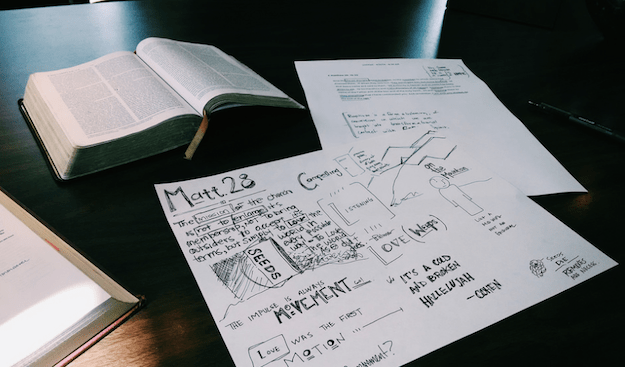 Once I have a good idea of the direction of the message draw up a sketchnote of the sermon that shows how it will flow and contains major images, quotes, and ideas. Write sermon once, twice, three times. However many it takes for the right things to become clear. 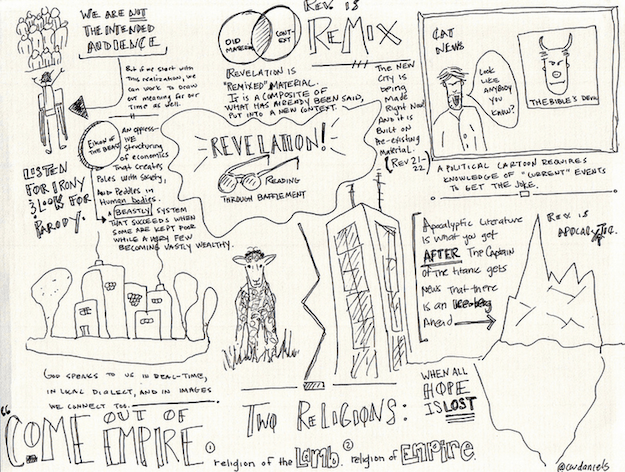 Here are a few examples of some of my sketchnotes from previous sermons. From my Easter sermon called “Hope on a Tightrope” – Yes, I borrowed this fromCornell West’s book with the same title. From “Like Seeds Being Poured Out.” This is an example of notes from my sermon study on Matthew 28 that became more organized here. A combination of images that all represented an 8 week study from the Book of Revelation. And for the iPad Paper from 53 is great for sketchnoting. My study is more focused than it used to be. Drawing takes concentration. Thinking of images to represent big concepts forces me to slow down and pay closer attention to what is being communicated and how to communicate it. 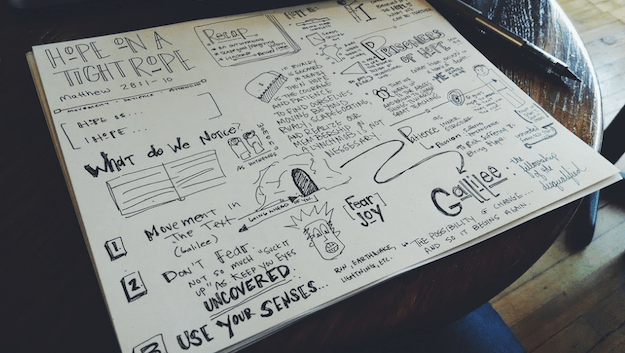 My preaching has become more image heavy, and less abstract because of my sketchnoting. I remember the content and direction of my sermons way better. The sermons I sketch up in advance are almost always locked in my memory in a way that the others aren’t. I like getting my right brain more involved in what I’m doing and I personally feel more fully engaged in the whole process. It is fun to share the sketchnotes with others and post them on my blog when I post my sermons. Sometimes I use my sketchnotes in my sermons and on slides to communicate something. It adds a nice “analog” touch as well as helps to communicate difficult ideas in simple ways. This may not be for you, but my guess is there are a lot of very creative writers and preachers out there who would find a fresh flow of creativity by incorporating drawings into their work flow. This is a post that originally was featured on the blog Antioch Session.